The respective towns Morwell and Nunawading are set to become ‘Funky Towns’ on the weekend of 13 and 14 July with Pseudo Echo, performing live! At a time when bands appear and disappear as quickly as twitter hashtags, it is a testament to Pseudo Echo to have created such a legacy which enables them to tour the country and abroad to sold out crowds for over three decades. Having well and truly made their mark on hearts around the country Pseudo Echo are performing live at two Victorian locations this July for what will be two unforgettable shows, fans of the band and of live Australian music would be mad to miss out! This is a rare chance for fans to experience an electrifying and career defining set list that spans 36 years in a full headline show featuring rarely performed songs from early in their career. Pseudo Echo formed in the early 1980’s and from the start, quickly established themselves as a household name becoming one of the most influential bands in the country. With smash hits such as ‘Listening’ and ‘A Beat For You’ from their debut gold album ‘Autumnal Park’ followed by the platinum selling ‘Love An Adventure’ album which featured ‘Don’t Go’, ‘Living In A Dream’ and the title track ‘Love An Adventure’ the band was set to make its mark on the international stage. The band went on to do exactly that, releasing their worldwide smash hit with “Funky Town”, which still floods the dance floor to this day…. 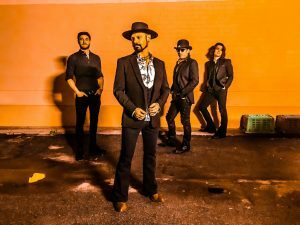 Now Pseudo Echo’s ever evolving look and sound, continues to attract a whole new generation of fans… releasing new music with albums such as “Teleporter”, “Ultraviolet”, “Live at the Viper Room” (recorded at LA’s iconic Viper Room). And for 2018 for the first time in the band’s history Pseudo Echo will be showcasing their first female member on bass Keytar as well as their latest single; the sizzling “electro funk rock” version of “Nutbush City Limits”. Be sure to catch all their hits, as well as some rare early gems too.